Do I smell nuts to you? The other day I stole a letter sent to New Times by a local family with a kid who’s severely allergic to nuts. We’re talking anaphylactic shock, dead in 20 minutes allergic. It’s a nightmare: They’re worried about sending him to school where nuts are everywhere, or trick or treating, or even baseball games. After all, the song doesn’t go, “Buy me some allergy-free nut substitute and Cracker Jacks … also without nuts.” It’s a horrible thing for a family to deal with. But there’s a solution, or at least a work-around. Dogs can be trained to sniff out the smallest traces of nuts in any product. Did you know this? I had no idea. But said pooch costs $10,000. That’s $10,000 to teach a dog to sniff nuts. I got my dog cheap at the pound, and he already sniffs nuts. You know, I just had to go there. The family’s trying to raise money to buy the dog, but they’re well short of the total cost, as well as the $5,000 the dog trainer wants as a deposit before even beginning to train the dog for this kid. Compassion isn’t cheap, apparently. With such a price tag, these parents will need an emotional support dog to cope with the depression after they’re cashed out trying to buy the nut sniffer. There’s got to be an easier, cheaper away. My comment: Comp the dog. Or at least charge whatever a comparable breed would cost. Or get insurance involved. Shouldn’t this be something insurance would cover? At least under President Barack Obama’s new model? My second idea: The sheriff’s department has a robot that sniffs out bombs, but so far has only sniffed out stuff like poop in the garbage and detonated some poor shlub’s briefcase. Convert the poop-sniffing robot into a nut-sniffing robot. It will continue to serve a noble purpose, and the name won’t lose its giggle factor—at least among adolescents like me. Dan DeVaul is guilty! Sort of. Actually, DeVaul is a criminal code violator and deserves to be prosecuted for his flaunting callousness toward human life. Well, not really. After years of lime-lit cases—covering multiple code-violation charges in the county’s pseudo-judicial role and the superior court’s less-pseudo-judicial role—DeVaul was handed two guilty verdicts for having too many cars and creating a fire hazard. Most everyone around here is likely either sick of hearing about DeVaul, glad he was found guilty, glad he was found innocent, or still wondering who the hell this guy is. For those in the latter category: DeVaul owns a chunk of property on the outskirts of SLO. He runs a sober-living facility there because comparable county services are thin on the ground and/or piss poor. But his property is an eyesore, even as a sight for sore eyes. The man has been fighting two battles: a civil-type one with civil-type charges in front of five county supervisors and another nearly identical set of charges, but with criminal underpinnings instead of civil ones. And about those: The criminal charges barely stuck. DeVaul was found guilty on two counts, innocent on another two, and the jury was dumbfounded and stalemated by the remaining five counts. Why? They didn’t think the witnesses were credible and further believed the whole case was the equivalent of running a train into DeVaul. What’s more: DeVaul’s defense attorney, Jeff Stulberg, didn’t call any witnesses. Have we slipped into an oversaturated, overacted, ripped-from-the-headlines TV lawyer drama here? Stulberg’s only real points of defense came from his closing soliloquy, which apparently was just shy of General Patton standing in front of an undulating flag. I hear that a few people in the courtroom actually stood and saluted, but I can’t confirm. Stulberg didn’t call one witness, and the move pretty much worked. You can do that? Did I miss a meeting? Either Stulberg’s a maniacal genius, or all this DeVaul business has gotten way out of hand. Stay tuned for next season. I hear they’re adding Courtney Cox to the cast as a no-nonsense attorney, and watch out for a surprise cameo from Kanye. Every once in a while, there comes a bit of news that tickles me down to my blackened, cancerous heart. Intern Matt Fountain reported this week that SLO County sheriff’s deputy James Lesperance got busted on suspicion of driving drunk in Arroyo Grande during Labor Day weekend. The police caught up with him at about 3:30 in the morning in front of a convenience store. Strap in, because this gets better. The police followed him there because of reports that a bunch of guys in a vehicle that looked like the one he was driving were romping around, beating people up. As best as anyone can figure, two passengers in the car were charged with battery, but Lesperance is just facing DUI charges. You don’t want to know what the Shredder smells like. 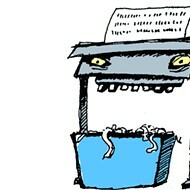 Sniff out the Shredder at shredder@newtimesslo.com.